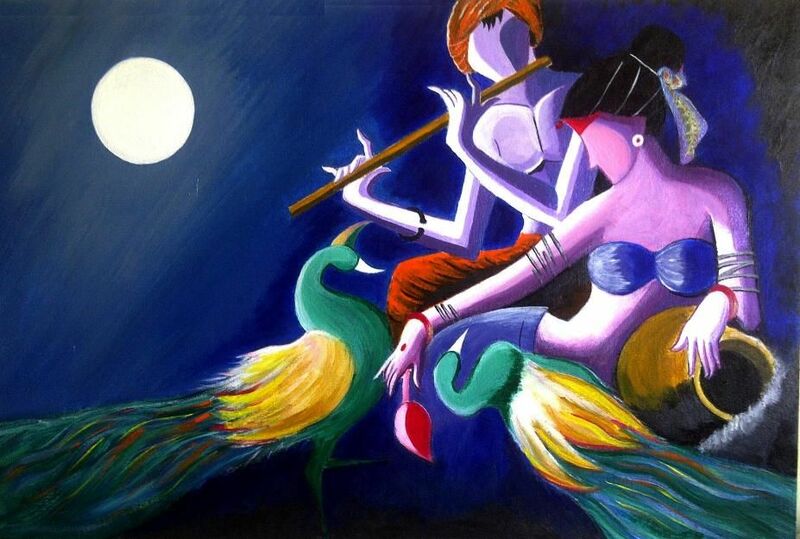 We have heard the eternal love story of Radha Krishna and it inspires many people to fall in love. Radha Krishna love story not only teaches us how to love but also tells us how to make others fall in love with you. These are some things we heard but we can also feel these things from the Radha Krishna paintings. Radha Krishna paintings are not just normal paintings, they are painted with eternal love and feeling of Radha Krishna. And this is the reasons why Krishna Paintings indicates to Radha rani that “I am your action, word and mind my beloved”. Radha and Krishna have a unique love story in which they both did not get marry but become an inspiration for all that getting married is not the happy ending of a love story. This beautiful and eternal love of Radha and Krishna can be easily seen in the Radha Krishna paintings. In some paintings, Krishna is holding the hand of Radha and it has been known that Radha is the supreme Goddess and Krishna enchanted the whole universe where Radha’s universe is Krishna and this is the reason she enchants the name of Krishna whole day. In these Radha Krishna paintings, we can see that Radha is the faithful devotee of Krishna and we all know that Radha is the incarnation of supreme Goddess Lakshmi who is the goddess of wealth. They both took birth as a human and then they told everyone about love. Radha stayed in Barsana whereas Krishna was in Vrindavan and these two places are the witness of Radha Krishna love. Many poets also made poetry on the eternal love of Radha Krishna and it really inspires numerous people. But everyone has a question that why Radha Krishna did not get married? So, let’s find out this answer in this article. Why Radha Krishna did not get married to each other? Radha and Krishna both are incomplete without each other yes, there love is inseparable they both get complete when to stay together as a couple. We all heard the stories of Radha Krishna love and their bonding of sharing things together by doing “RAS” in the midnight with other gopis of Barsana. From the eras, we used worship Radha and Krishna together and keep their statue and Radha Krishna paintings in our temples. They are made for worship together and but after listening and reading the love stories of Radha Krishna everyone has a question that why they both did not marry each other? As per the research and studies, it is believed that Lord Krishna never believed in marriage and according to him that falling in and getting married are the two separate things. As per the religious Vedas, Krishna said and believed that marriage is kind of agreement between two people whereas love is an emotion which is selfless. In love, you take a pledge to yourself that you will someone with complete purity. If you love someone with complete purity then marriage is not required to have a happy ending because he believed that marriage is the materialistic thing. Radha was completely in love with Krishna that is the reasons she loved him like a devotee. And you can say that the love between Radha and Krishna is a relationship between God and devotee. Radha and Krishna are inseparable and that’s why they both never get separated but Krishna has numerous energies and he had to marry two different personalities whereas the most pleasing thing is the Radha energy which used to please Krishna. The relationship of Radha and Krishna you can easily see in the Radha Krishna paintings and somewhere you can find these eminent love level in the Krishna paintings as well. So, to express the love with high and great devotions they both Radha and Krishna decided never to get married to each and people considered that this is the reason why they both did not get married? Radha and Krishna have a very unique love story which is not just only inspiring but also makes others fall in love. In Radha Krishna paintings, we can see the way they both Radha and Krishna looking to each other. The way they had time together tells us that getting married is not all things you should if you are love. If you love someone with complete devotion and marriage is not the last stage and this is not the only happy ending. So, we should learn something from Radha Krishna and start spreading love in the world.